A couple of years ago, I started a tradition where I highlight my favorite colors from the color forecasts from the various paint companies for the next year. More than any other design/color forecast that comes out, I look forward to the paint color predictions from paint companies themselves because they are by far the most accurate indicators of paint color trends. 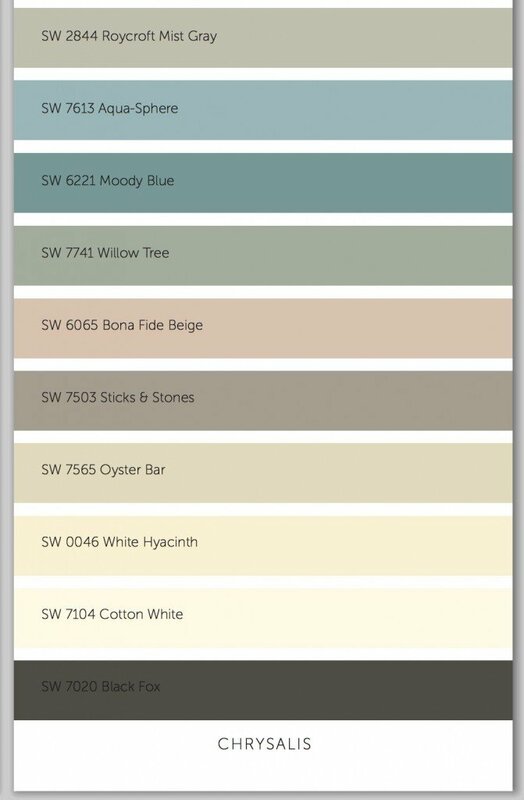 Several paint companies have recently released their forecasts for 2015 and today I thought I would share a few of my favorites. **By the way, every room featured in this post is one of the paint colors in the 2015 paint forecast. The names of the paint color are directly below each image for you. Paint companies predominately base their forecasts on their current bestselling paint colors and what the consumers are actually buying and painting on their walls. The best part of this is that paint companies have programs to track even the slightest changes in tones as we buy paint color and move from one color to another. The combined mix of all this information enables paint companies to pinpoint with near perfect precision where we are heading in paint color. I love this information because it’s “real time” and what’s happening today since it’s based on current consumer paint trends. I don’t make color decisions based on trends but I do like to know where we are heading and use these colors as a starting point. 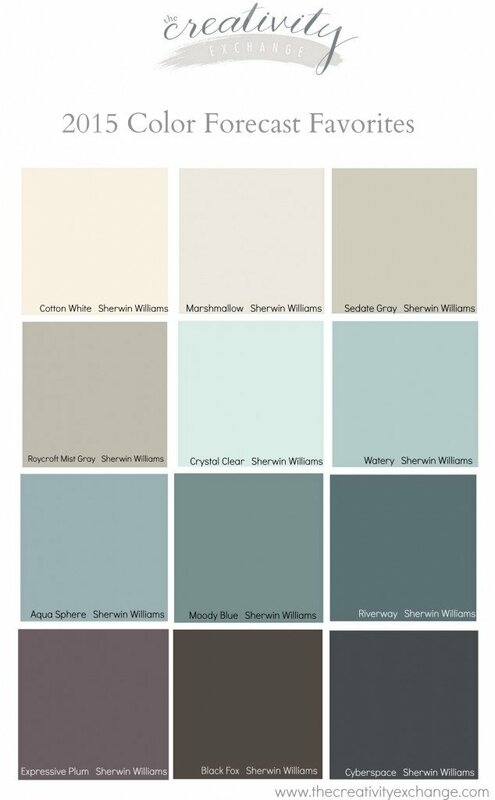 Benjamin Moore does not have their 2015 color forecast out yet but Sherwin Williams, Dunn Edwards and few others have come out with theirs. The common thread found in all of them is change. All the paint companies are forecasting that we are finally starting to move from our safe calm neutrals cautiously into muted color. These are subtle changes but I have been seeing that subtle shift into more muted wall color lately as well. Today, I wanted to focus on the Sherwin Williams 2015 forecast because they pulled together some gorgeous (and realistic) colors to represent where they think we are heading in consumer paint color trends in 2015. The Sherwin Williams forecast has always been my favorite because it’s more realistic/real time to me. 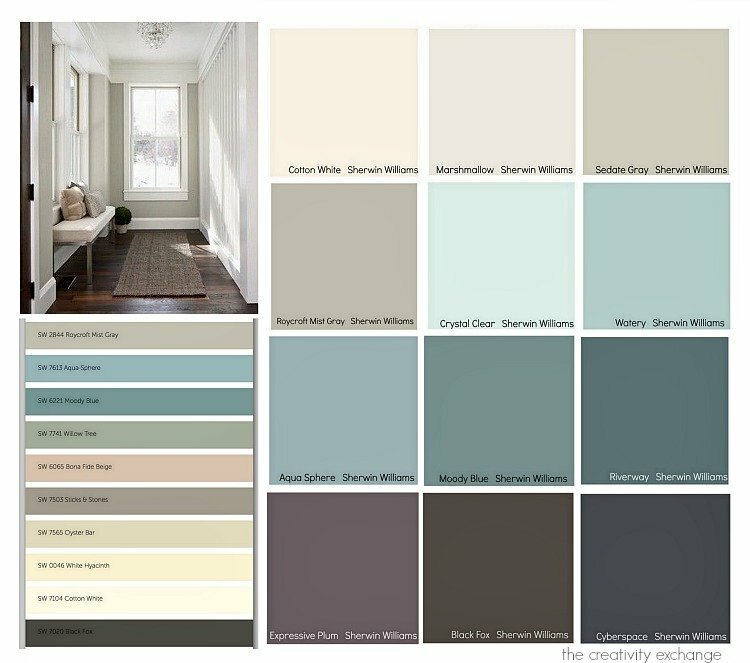 Sherwin Williams full 2015 color forecast can be found here but just to give you an idea, each year, Sherwin Williams breaks their forecast down into four groups. This year, the four groups/categories Chrysalis, Voyage, Buoyant and Unrestrained. 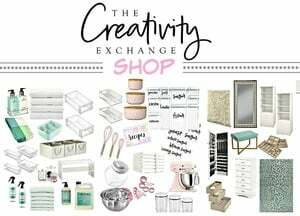 These groupings/collections are broken down by neutral/softer palettes, medium bolder palettes, future color trends beyond a year and a collection of forecasted highly pigmented colors. The other two collections (Unrestrained and Voyage) are beautiful but they are much bolder color. So if you’re looking for brighter and bolder, you’ll want to check out the rest of the collections here. 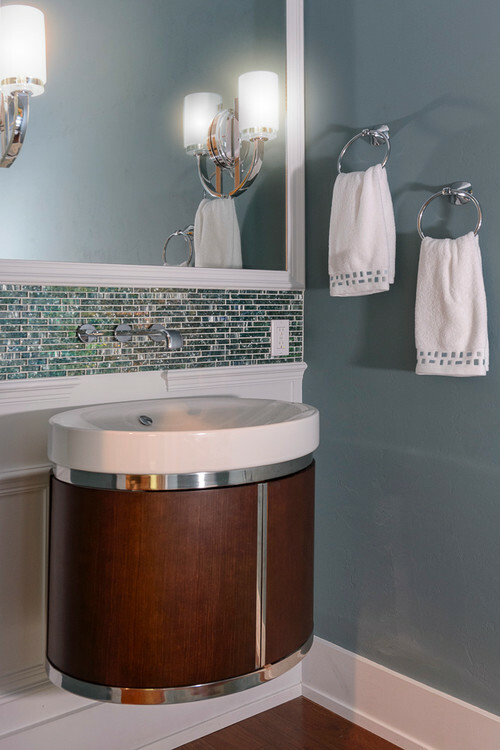 Contemporary Bathroom by Newberry Home Builders Emerald Ventures, Inc. I picked out the colors that I felt that work well and that I was familiar with. All of these colors are great wall or accent colors (Black Fox is an awesome trim/interior door color!). So I have to know, do you have a favorite out of all of these colors? I am so drawn to Riverway. I would love to use Riverway on an accent wall somewhere. I also like Crystal Clear as well. If you want to see more rooms with exact paint colors, you can check out my Pinterest Board “Pick a Paint Color”here, where I have more than 300 rooms with specific paint colors pinned. Over the next few weeks, I will be pinning colors/spaces from the 2015 color forecasts as more forecasts come out. Thanks for hanging out with me today and if you want to see my post for 2014 color forecast post, you can find it here. Great post. I actually am falling in love with Black Fox. I picked up a Color Collections – Liveable Luxe booklet and it really pops. I plan to use it on an accent wall. Looking forward to pics on Pinterest. Thanks Alana! 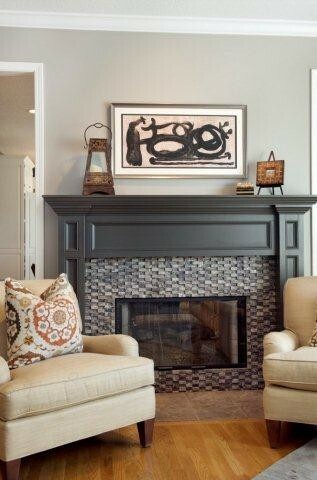 Yes, Black Fox is such a great color on trim, interior doors and on an accent wall. It has a hint of brown and gray in the mix so it works well with almost any other color. Thanks for your note! Thanks for a great post! Loving many of the new colors including Black Fox. Thanks Shari! Yes, I love Black Fox too! All of these colors are so very rich in depth! 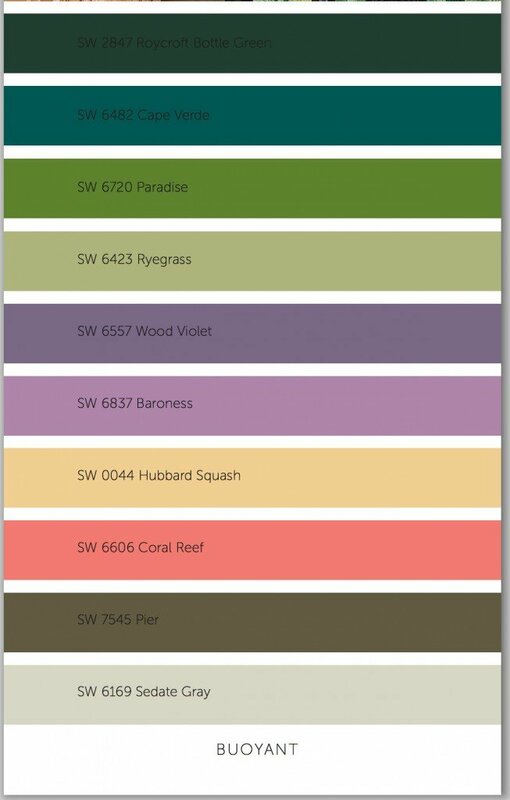 I’m excited to start seeing these colors used in homes. Thanks for stopping by! Ha! I painted my bedroom Watery last summer so feel “ahead of the curve” for once in my life! Gorgeous colors, Cyndy. Thanks for the beautiful post. Do you think Black Fox would be good on a kitchen wall where the cabinets are cream and the granite is dark brown and gray? Very little wall space but wanting to glam it up a bit but do not want the room to be dark. Very white trim with cream cabinets and a big window. A year ago I painted an accent wall in my master bath with Riverway. The other walls were SW Requisite gray. Loved the look. I love the Black Fox color…well I think I love all of them. 🙂 I always love that you share beautiful pictures to show the colors in a room as well. Sometimes looking at just a swatch is hard to imagine on a whole wall or in a room. I just painted my nursery in Watery with a grey (not one of the ones featured) and I love it! Beautiful color! Just painted the exterior of house and went w Black Fox for doors and shutters. I love it!! Planning to paint master bedroom soon and trying to decide on blues. Your selections is beautiful! Thank you!! Going back to some of the old colors that I loved so much. Great can’t wait to do some new painting in my house. I love marshmallow and crystal clear together. I think they would be perfect for my great room and kitchen/dining room. I cannot wait to use Black Fox on my table & chairs. Really interesting shadr. My front door (exterior) has been painted SW Black Fox for 7 years. 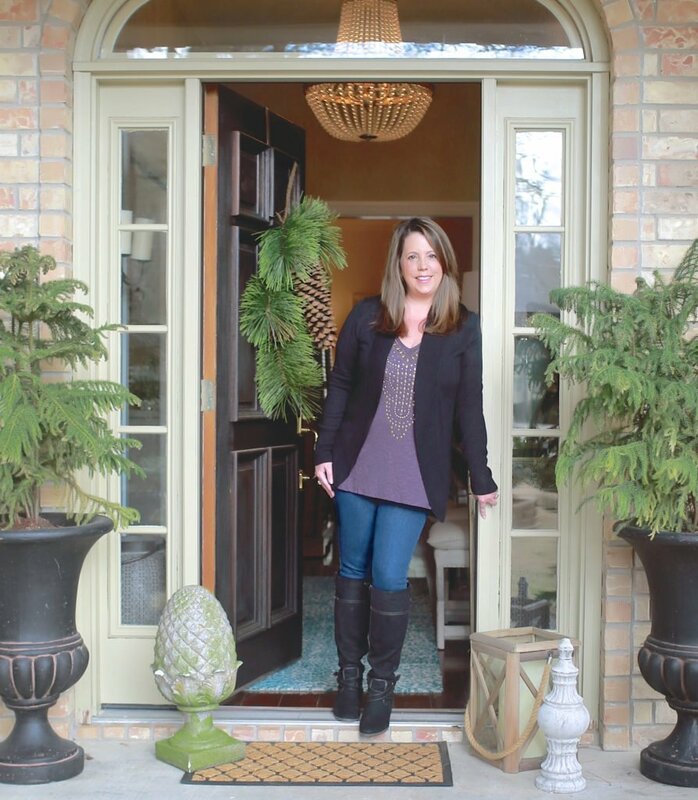 It really pulls all the light neutrals together, and makes the door the focal point. I love it. I’m considering painting a bathroom vanity Black Fox too. I wish I would’ve seen this article prior to having my upstairs painted. I’m really digging the Roycroft Mist Gray. I LOVE black fox! I feel in love with this color Last year when I painted my formal dining room this color and then accented it with gold. It was beautiful! I moved into my new home a few months ago and had to find a place for Black Fox, so I painted my kitchen with the color. All I can say is WOW! Then I painted my office with moody blue it is also a beautiful color. Looking for ideas for the rest of the house:). What a great color palette! I have river way in my front living room and always get compliments on it! I didn’t pick it, my hubby did, the front living room was his office at one time. Excited to see many of the colors in my home on the palette! Thank you! On Labor Day I painted my master bedroom in Riverway. I have a tray ceiling so painted that part Tatami tan (or something like that) and then painted the tray inset of the ceiling Moody Blue. It was such a bold color that I was worried about it but it has a very luxurious look and feel. Everyone who has seen it loves it. Several years ago I painted the master bath Java (it looks close to the brown on this chart). 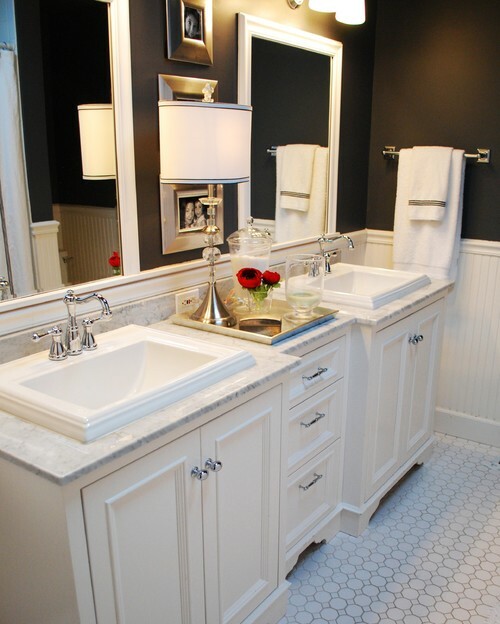 The bathroom was big and has white cabinets, doors, trim so the color is not over whelping and is a nice contrast to the Riverway in the bedroom. Ha! I painted my dining room table and an accent wall in black fox a few years ago! Everyone comments on what a gorgeous color it is! Thinking of painting Watery in our master bedroom.